Who doesn’t love a great, hearty omelet for breakfast? Luckily in Indiana, we know how to make a mean one. From Florentine omelets, to veggie omelets, to meat lover’s omelets, you can get all varieties and the best quality at these 10 egg-cellent omelet places in Indiana. At Toast and Jam, it’s all about delightful, homemade meals among friends and family. It all comes from the heart at Toast and Jam. The food is fresh, the company is genuine, and it’s about making the most out of your breakfast every day. Try a delectable Crab Florentine omelet, or the unique Hog Heaven omelet, topped with pulled pork! You know a restaurant is up and coming and has incredible food when Guy Fieri from “Diners, Drive-Ins, and Dives” comes to visit! 3 Sisters Café in Indianapolis came about in 1992, and has been serving up outstanding food for over 20 years. The best thing about 3 Sisters Café is that you can build your own omelet, or try one of the omelets of the day. 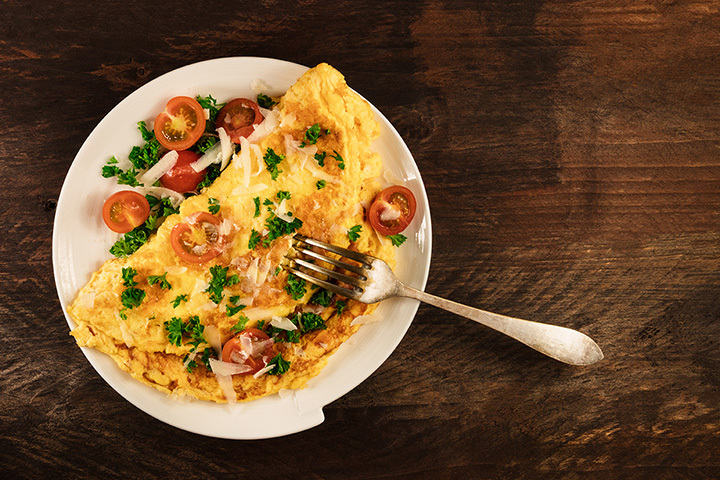 When you build your own omelet, you get to choose from a variety of fresh and delicious ingredients such as tomatoes, feta, mixed squash, exotic mushrooms, eggplant, and more. Brunch at @3sisterscafe. ✓✓✓😋💥😋 Coming here is like being part of a meal that you and your closest friends put together: super chill atmosphere, genuine effort & creativity, above average ingredient sourcing, strokes of brilliance from family sourced secrets, some definite misses since none of you are chefs, but as a whole and experience that is entirely enjoyable. Their giant housemade beer biscuit is the best biscuit I've ever had: pillowy crumb, light toasty crust, thoroughly buttery without being heavy, and entirely mouth watering. Likewise, Sara Jo's grilled cheese is quite clever. The parm crust adds audible crisp and has caramelized umami notes that go wonderfully with the smoked Gouda; bright lemon from the arugula punctuates the experience. Then, the corncakes are spectacular. These have all the beautiful corn grit of (great) corn bread but amplified by a noticeable shell like crust. Juicy blueberries interspersed within along with vibrant housemade blueberry compote, lemon curd & whipped cream contributions make for a 10/10 dish. Indulgent Whole Wheat Pancakes are also well thought out. The additional structure of a whole grain stands up to their massive size and delivers a stronger heartier bite that tames quantity of sweetness from syrup + mix-ins. While the deservedly famous pie paired a truly flakey golden crust with a velvety subtly tangy goat cheese filling that had blueberries with just the right amount of sweetness. But in their creativity and peppy effort, the kitchen slips at times: house made bagels which seem to come from a practice batch (small, irregular, dense, hard) or a porridge that in it's enthusiasm for offering a "gluten-free" alternative forgets about making it taste...like anything. Powerhouse potatoes are comical with no crust, microwaved style melted cheese & random pieces of tofu "for health". Finally, my Grain Bowl had a fair share of not so fully cooke vegetables, but was paired with an excellent bbq glazed salmon You walk in and feel like this is a summer camp parent's dinner where the well intentioned staff will give you 💯% effort. Forgiveness is assumed and exploring is part of the experience. Recommended. The Original Pancake House (with locations in Indianapolis, Noblesville, and Fishers) is a family owned and operated restaurant, dedicated and passionate about serving their customers the best breakfast possible. It’s a place for family and friends, co-workers and acquaintances. During the summer, guests can enjoy a great outdoor seating area and in the winter, relax in a warm and welcoming environment. What makes the Original Pancake House’s omelets different is that they are oven baked, which makes them a bit healthier than traditional omelets. Try a delicious vegetarian omelet or a freshly prepared spinach omelet. What’s better than breakfast ALL DAY? Here at the Sunrise Café in Noblesville, the service is friendly, the atmosphere is relaxed and welcoming, and the omelets are even better. The bacon and cheddar omelet is a favorite, as is the ability to create your own omelet, which is served with hash browns and your choice of homemade toast. Lincoln Square Pancake House has one goal: provide their guests with great food at a fair price. The service is fast, friendly and professional and the restaurant itself is clean, comfortable, and welcoming. Not only is the service great, but the food is fantastic. If you find yourself in Indianapolis and craving an omelet, this is the place to go. Try one of 10 delicious omelets, such as the Greek Omelet, West Coast Omelet, or the pesto omelet. The windmill is a staple and a source of comfort here in Indiana. It gives power to families, livestock, and towns. Here at the Windmill Grill, they provide much of the same comfort to their customers with scrumptious food, and a wide array of omelets to choose from. Try one of their incredible Old-Fashioned Omelets, which features three eggs whipped and loaded with your favorite ingredients, potatoes, and toast. Choose a delicious vegetable omelet or the spicy Southwestern omelet. Ruth’s Café is located right in the shopping district of Indianapolis that features unique brunch choices and breakfast ALL DAY. When you walk inside, the first thing you’ll notice are the uplifting “Ruth-isms” on the wall, featuring positive messages to take with you or enjoy while you eat. Enjoy a savory and protein filled salmon omelet, the Old School or Not So Old School omelet, or build your own! Whatever you choose, Ruth’s is guaranteed to satisfy your omelet craving! Potato pancake benedicts who knew 😛 +this place had the cutest trinkets and decor!! The Scrambled Diner provides customers with a delicious, one of a kind taste experience with every bite. From the traditional breakfast to the family favorites, this is the place to go if you want to love breakfast again and try something different. The ingredients are fresh and flavorful, and everything is made by hand. Offering six different omelet selections, it’s so hard to choose. The Tangled Up In Blue or Uncle Ray’s omelets are fan favorites. George’s Family Restaurant is a family-owned, classic American diner where everything is made from scratch. It’s comfort food at its finest, and they have some of the most ‘egg’-cellent omelets! Be sure to try the popular George’s Favorite Omelet, as well as the California Omelet. If need be, omelets can be made with Egg Beaters or egg whites. Come to the Another Broken Egg Café in West Lafayette, Indiana, for some of the best omelets you’ve ever eaten. Here at Broken Egg, everything is made fresh and with creativity. Their passion is to create amazing dishes that are “craveably” delicious and ‘egg’-ceptional. Another Broken Egg has a warm and inviting atmosphere, and delicious eggs. The Hey Lucy Omelet is highly recommended, as is the Skinny Omelet.